Contractors are ramping up field construction of the components of the $160 million Mary Rhodes Pipeline Phase 2 which will deliver water from the Colorado River at Bay City to water users served by the San Patricio Municipal Water District and others in the Coastal Bend region. 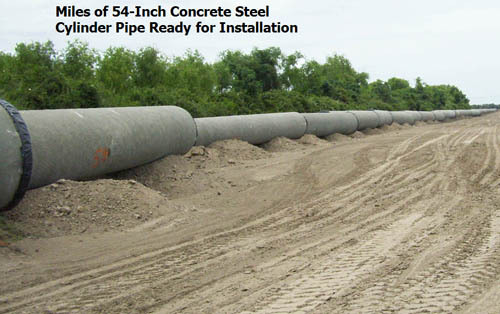 Miles of concrete steel cylinder pipe joints have been manufactured and are being delivered to the pipeline route which stretches from the Colorado River to the existing Lake Texana Pump Station on the south side of the Palmetto Bend Dam. In February, the City of Corpus Christi, acting as manager of the regional water supply system, awarded the two primary construction contracts for the project. 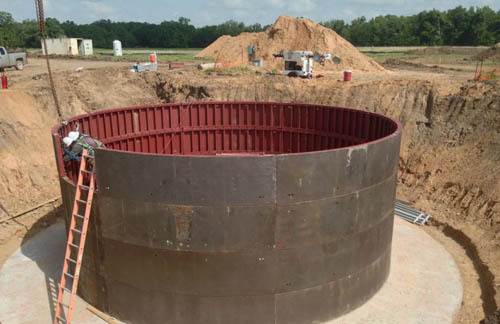 Garney Construction of Kansas City is building the 41 miles of pipeline, a 6 million gallon ground storage tank and the tie-in to the existing Mary Rhodes Pipeline system built in 1998. The contract also includes installation of fiber optic communications equipment. Garney was the low bidder at $84.9 million. 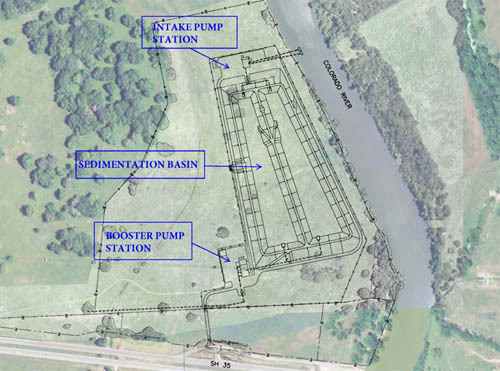 Oscar Renda Contracting of Roanoke, Texas, is building the sedimentation basin and pumping facilities that will take water from the river at Bay City under a $29 million contract. Pumps for the project were ordered under a separate $4.5 million contract in 2013. The schedule calls for project completion during the summer of 2015. Pipeline project components on the south bank of the Colorado River will include two earthen sedimentation basins, each with a capacity of 12 million gallons. There will be a low-pressure pump station to lift the water out of the river and into the sedimentation basins at rates up to 46 million gallons per day. 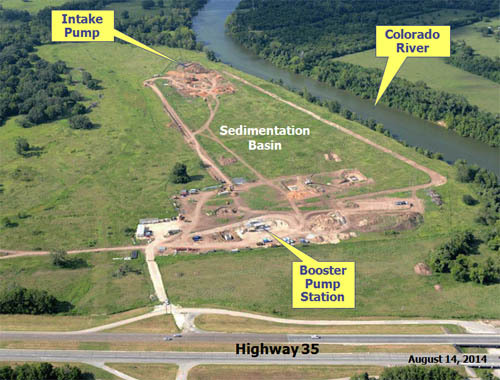 The final element will be a high-pressure Booster Pump Station to push water southwest toward the connection with Mary Rhodes Pipeline Phase 1. The pumps and pipeline will deliver the water to the 6 million gallon concrete in-ground storage tank near the dam at Lake Texana. The water will then flow by gravity feed to a tie-in point on the 72-inch Lake Texana Pump Station intake suction line. It will blend with water from Lake Texana and be pumped southwest toward water treatment facilities in Corpus Christi and San Patricio County. Freese and Nichols, Inc. has provided engineering services during a decade of project planning and design. It is now providing construction management services including daily inspections with an overall estimated cost of $3.9 million. AGCM, Inc. is providing construction observation services on installation of the 148,000 feet of 54-inch pipe and 1,900 linear feet of horizontal directionally drilled 48-inch pipe. This third-party observation of pipe installation has a total cost of $1.6 million. In 1998 the regional water system purchased 35,000 acre-feet per year of senior water rights in the Colorado River from the Garwood Irrigation Company. When Colorado River water begins flowing it will mean that the Corpus Christi regional system has taken another big step toward water supply diversification and improved reliability in times of drought. Water supplies will be coming from three river basins – the Colorado River, Lake Texana on the Navidad River, Lake Corpus Christi on the Nueces River and Choke Canyon Reservoir upstream on the Frio River which is part of the Nueces Basin. [Read about the history of the Garwood water HERE]. 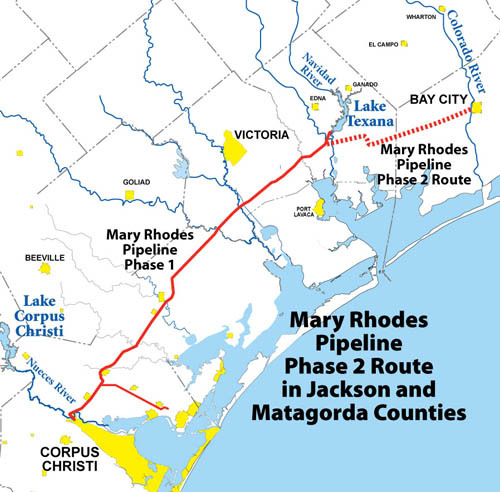 The Phase 2 pipeline route starts just west of Bay City in Matagorda County and follows the path of State Highway 35 southwest to Blessing where it then follows the Union Pacific Railroad to La Ward in Jackson County. 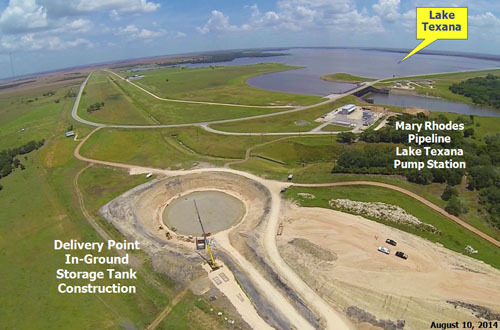 From there it turns north and west to link up with Mary Rhodes Pipeline Phase 1 at the Lake Texana pump station.